I began Inktober 2017 with the goal of inking all my drawings with a dip pen. I abandoned this plan on day one. I also struggled to decide on a topic this year, so I sought the advice of my friend, Paula (of The Laughing Goat). 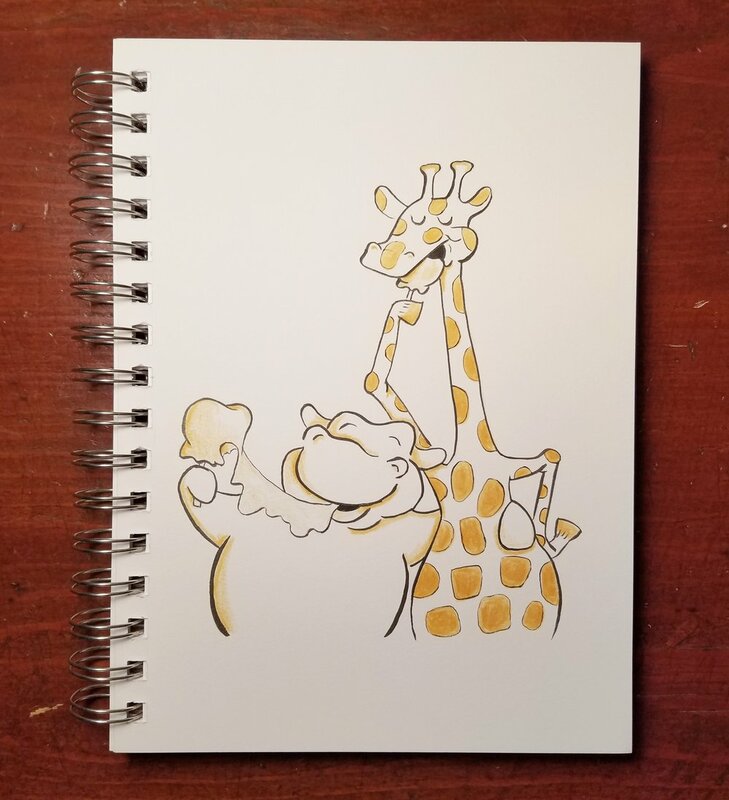 She suggested I continue the theme I began on Art Drop Day (a drawing of Fiona the Hippo), but add Tajiri the Giraffe to the storyline. 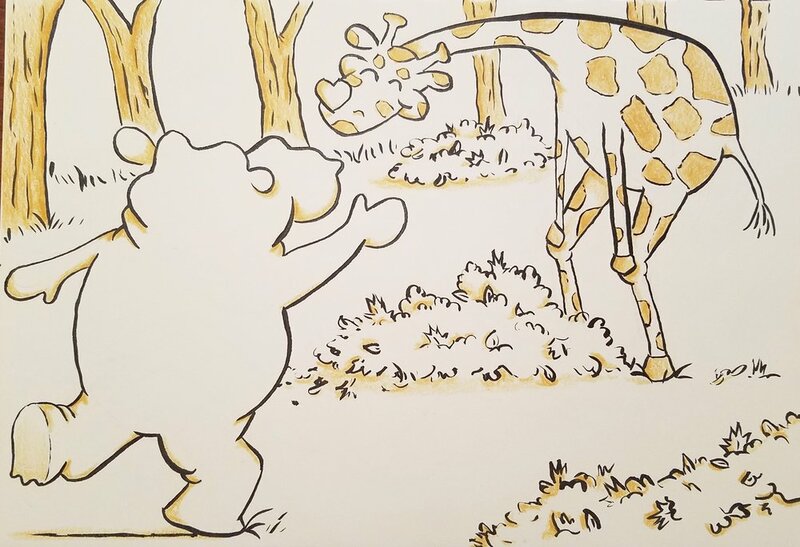 Posts about Fiona, a premature hippo beating the odds, and viral videos of April, the ever expectant giraffe awaiting delivery of her baby, Tajiri, often gave me a pleasant break from the vitriol nature of the internet this year. 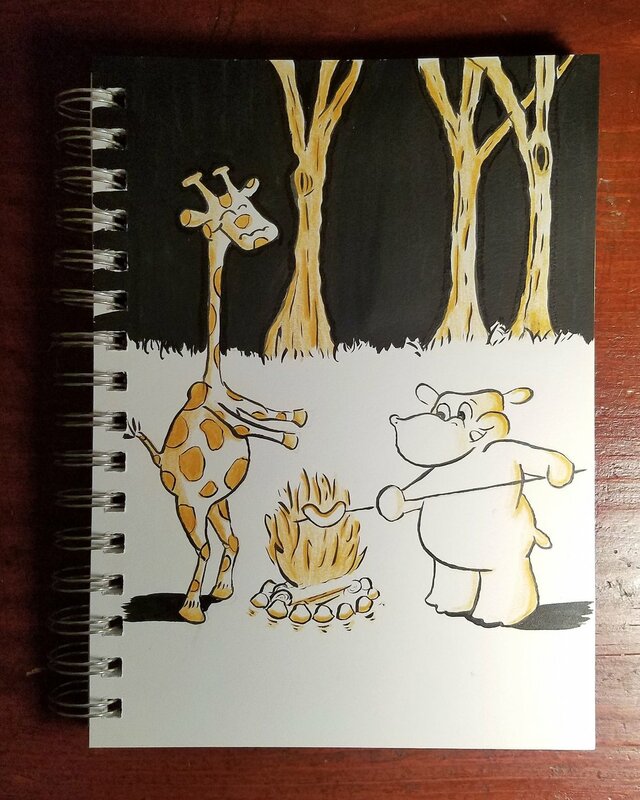 Paula's idea seemed like the perfect way for me to participate with Fiona and Tajiri in interrupting the bitterness so prevalent in today's social media feeds. 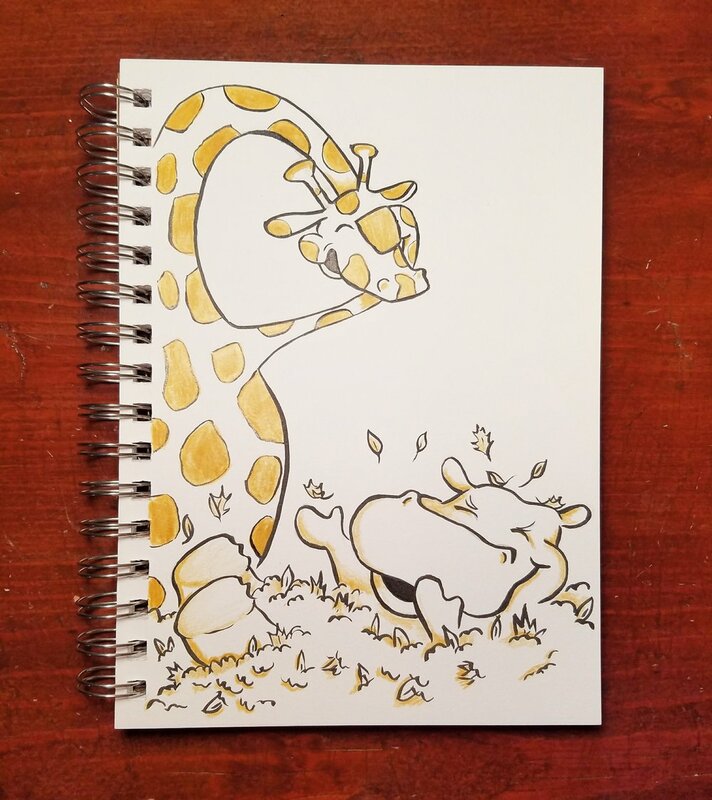 I enjoyed adventuring with Fiona, Tajiri, and a brush pen(!) 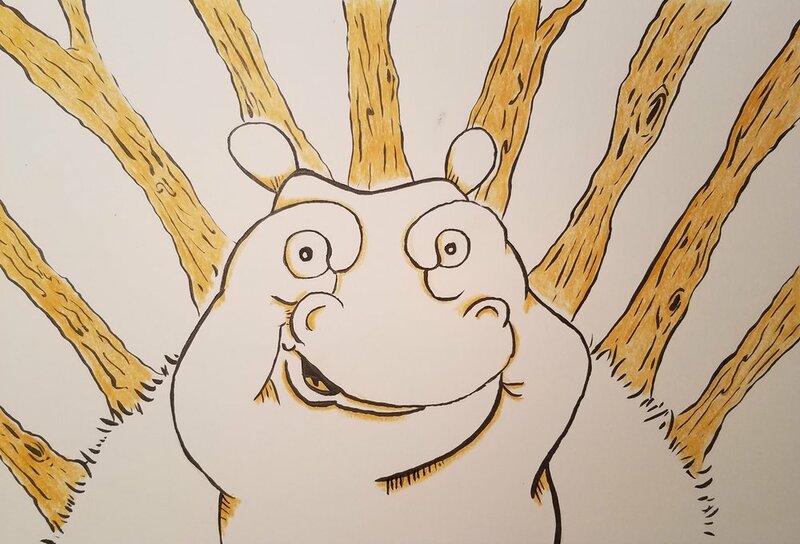 through Inktober, and am hopeful that my silly drawings gave a second or two of happiness to others this month! *The dip pen did make one other brief appearance on day 17 (corn maze) due to an unexpected ink outage in my brush pen. Silhouetting is one of the main design principles I tried to follow in all my Occuclaytions' drawings. This principle states that if an image is blacked out, the character should still be readable. According to the Society of Visual Storytelling, the silhouette should emphasize shape and clarity, while also distinguishing a character's unique features. I happened to catch a shadow of my film director mid-sculpt. This allowed me to check my progress against the silhouette principle. To my delight, he was entirely distinguishable in shadow form. Clarity of design is critical in character identity. I intend to run this simple shadow test on all forthcoming sculptures to insure the highest level of readability. Up next: a tommy gun toting varmint! Horses are God’s reminder that artists are not, in fact, gods. If you’ve ever tried to draw one, I think you’ll agree. If you haven’t, grab a pencil and paper and you’ll see what I mean. If you still don’t believe me, try sculpting one in 3-dimensions. Clad it in bib overalls to remove all doubt. Here are my attempts. I am happy with the results, despite my difficulties. Horses humble, sure, but maybe it’s humility, not execution, that makes us more like God in the end anyway. Thanks for following along! Up next-a wolf in director's clothing! I spent the first few months of 2017 preparing for my Occuclaytions project by working through SVS Learn's “Breathing Life into Your Character Designs” class. The sketches below are my attempt to abide by some of the principles I learned. Although I am miles from mastery, I can already tell the influence the class is having on how I think through a drawing, and, subsequently, how I sculpt. Thanks for having a look! I'm on to sculpture number two, so stay tuned! I posted one of my favorite sculptures-an acrobatic mole with musical feet-a year ago this month. He was inspired, in part, by this image drawn while watching the movie The Book Thief (in which an accordion plays a significant symbolic role). I didn’t, and still don’t, care for the drawing, but the accordion (later morphed into a concertina) reverberated in my imagination long after I shut the sketchbook. Sometime after this, I read an article written by illustrator Joe Sutphin entitled, "A Cure for Head and Shoulders Syndrome." In it, Joe discusses budding artists’ tendency to draw characters straight on-portrait style, cutting off arms, legs, and any chance of a compelling story. According to Joe, no matter how well rendered a character may be, head and shoulders syndrome is a malady that must be treated. I suffer from a slightly different strain of the syndrome. It isn’t arms and legs my sculptures sometimes lack; it’s just story. My first attempt to alleviate this condition came when I decided to build a character around that ubiquitous squeezebox. I took notes, consulted reference, sketched a few ideas, wrote a vignette, and then sculpted Vaudeville’s most highly celebrated mole, George “Dutch” Williams. I’ve worked on several projects since then, but just like I couldn’t shake the inhale and exhale of the accordion from my imagination, I can’t shake the desire to create more story-driven pieces like Dutch. It is, therefore, my goal to spend the remainder of 2017 doing just that. I’ve begun work on a project that will, hopefully, breathe life into 16 fully developed characters. If all goes according to plan, I will compile these creations into book form by year’s end. I’m excited to get started, and welcome you to follow my progress via monthly blog posts and bi-weekly social media posts!